Fundamental Planetary Science sets out with the ambitious goal of providing a broad overview of all major solar system processes and features to the level of an advanced undergraduate student. 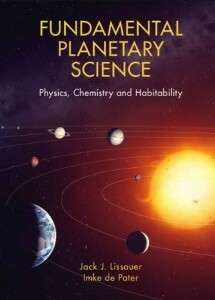 However, the book would also be accessible to non-specialists looking for a more in-depth look at planetary science than many popular science books would normally provide. The authors draw on their extensive knowledge and graduate text to cover most facets of the known solar system in good detail. Whilst only the final chapter focuses on astrobiology it still provides a comprehensive introduction to that particular branch of planetary science, covering: definitions of life, necessary conditions, hazards to life, evolution and the possibility of extra-terrestrial intelligence. The book is formatted to make the subject as accessible as possible to the undergraduate reader focusing first on the fundamental physical laws which govern orbital mechanics rather than diving straight in with the formation of the solar system as some texts choose to do. This provides useful context for subsequent chapters and leads the reader to logical conclusions about other features. To fully appreciate the equations governing these physical processes a first year understanding of calculation is necessary, however the vast majority of the book can still be enjoyed without this. A secondary school level education in physics, chemistry and occasionally biology are assumed, with further study of physics making for an easier read. A large collection of colour images help significantly with visualising the processes described. Each chapter ends with a useful summery of key concepts delivered in a concise and easy to read manner, comprehensive suggestions for further reading on the topic and a series of problems for the reader to test their understanding of the preceding concepts. Particularly challenging concepts and problems are marked with an asterisk. Overall the text is a comprehensive and useful introduction to a very wide range of topics spanning the solar system.